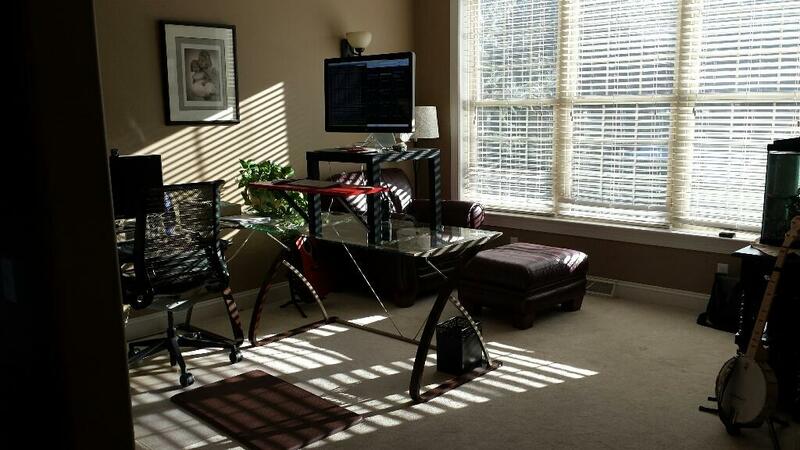 In February, 2014, I started working >50% at a proper standing desk at my house. In the year prior, I occasionally worked at a make-shift standing desk in my kitchen, which comprised standing at the island and resting my laptop on a flimsy Disney Princess art tray. The ergonomics were obviously terrible, so I only did that for a short spell. I had become enamored with the $22 standing desk and started planning my own. The final component was a proper monitor, which my employer provided in February. I followed the instructions to build the monitor / keyboard stand, and in no time I was in business. Note: while the research on the negative effects of sitting all day is pretty convincing, I could not find much actual evidence that standing all day is healthy, either. Anecdotally it seems that at best, standing mitigates some of the problems associated with sitting all day, but there may be downsides, as well. As for how it’s affected my health, I frankly can’t say. Despite standing for a year and riding my bike nearly year round now, including training for and completing 2 full centuries, I didn’t experience “weight loss for free.” Nor can I say that I focus better now, probably because for me focus while working remotely has never been a problem. Perhaps the most noticeable effect is simply that I have no problem standing for 6-8 hours a day. If the practical benefit of standing for a year is getting better at standing, I’ll take it. I realize that both of those are a result of incredible privilege. I think I could’ve made it stick without those, but it would have required a lot more grit and willpower, for me. I’m glad I started standing, I’m proud I stuck with it, and I’m certain I’ll keep doing it. I’ve gotten to the point where standing for work is just… the way I work now. Posted: February 5, 2015 February 5, 2015 . Posted in: Life, Work. Bookmark the permalink. I just passed the 4 month mark with my standing desk and honestly I could probably ditch it and go back to the way my office was before. I switch between standing and using my regular office chair that I bought an extended pneumatic cylinder for to bring it up to the correct height. Like you I stand for about 50% of each day and, like you, I haven’t seen a drastic weight loss (although I’m also not training or doing much in the way of physical activity right now because of the weather). Unlike you, I can’t take being near a Window. I like my coding environment darkened with the exception of some background lighting behind my Thunderbolt monitors. Understanding that you can’t believe everything you read on the Internet, I read some research a couple weeks ago that suggested using a regular sitting desk all day is not worse for your health as long as you get up out of the chair and at least stretch every 20 minutes. For most people that would be sufficient but for those of us that write code for a living, that 20 minute rule could be problematic if it interrupted your “flow” as you’re deep into solving a problem. Perhaps next step is a geekdesk. Helps with alternating between standing and sitting. I got one recently. Works pretty good.